Are you looking for a rewarding career? We love what we do and would welcome the opportunity to see if you can fit into our team, as well. Either fill out the application below or download the PDF version by clicking here and bringing it by our office. We look forward to hearing from you! Note: Even if there’s not a job posting, we welcome all applications from qualified and interested parties. Availability of positions rotates as we continue to grow and change and all resumes are kept on file and reviewed. Therefore, if you are interested in learning more about careers at Genesis, please fill out the form below. If we have a position that looks like it would be a match, we will be in touch. Job Summary: Duties include supervision of residents, record documentation, behavior management and quality assurance in a team oriented atmosphere. Discuss behavior, point cards, program progress and treatment plans, as directed by the Treatment Team, with residents on daily basis. Familiarity with policies in reference to treatment and supervision of residents as well as agency policies and missions. Knowledge of school program and behavior management protocol. 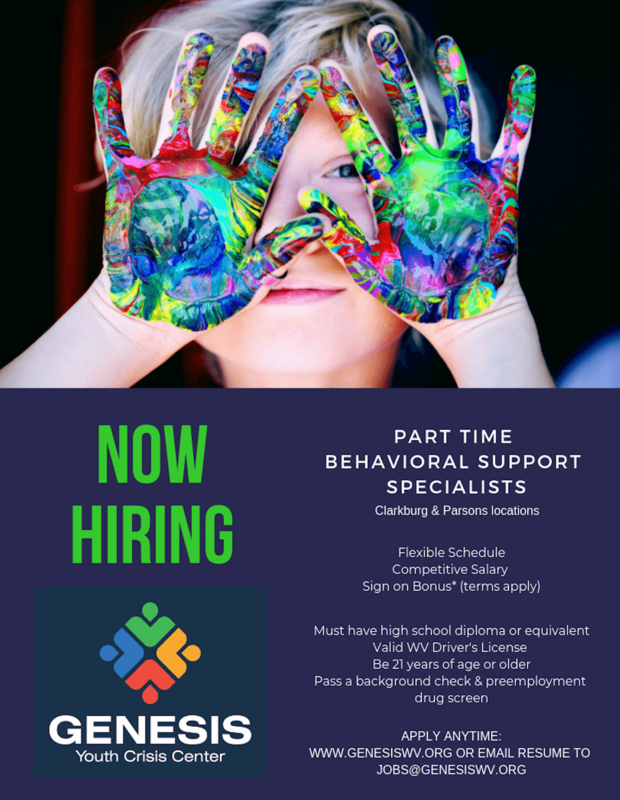 Minimum Requirements: At least 21 years of age, pass criminal background check, pass a pre-employment drug-screen, have a HS Diploma or equivalency and a valid WV Driver’s License. You also must pass First Aid/CPR and TCI (Therapeutic Crisis Intervention) training that we provide. Full-time employment includes full benefit package (i.e. health and life insurance, retirement, etc.). Experience: Behavior Management, 1 year (Preferred). Audit files and request needed information for continued of file maintenance. Maintain a consistent and professional relationship at all times with residents, co-workers, DHHR workers, Juvenile Probation Officers, Judges, family member, etc. Establish discharge plans upon intake. Ensure provisions are made for the basic needs of each resident, assume on-call duties according to schedule, Must be a professional and will be required to Travel. Minimum Requirements: At least 21 years of age, pass criminal background check, pass a pre-employment drug screen, and have a Bachelor’s degree in a human service field and a valid WV Driver’s License. You also must pass First Aid/CPR and TCI (Therapeutic Crisis Intervention) training that we provide. Experience: Case Management, 1 year (Preferred).